Hearing aid specialists on George Street. They moved here from their previous location at 208 High Street around June/July 2015. It was previously occupied by a betting shop called Jennings Bet photo, but according to a sign in the window photo, this closed at the end of trading on Saturday 28 September 2013. Not sure when Jennings Bet opened, but according to Google Street View the premises were vacant in July 2009. It was vacant photo, stripped out photo taken through window and advertised to let as of November 2013. Still vacant as of August 2014. 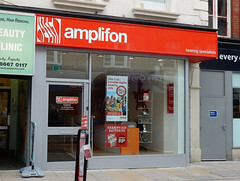 Still vacant as of May 2015, though with a sign in the window photo stating that a branch of Amplifon would be opening there soon. Last edited 2019-01-07 11:36:46 (version 32; diff). List all versions. Page last edited 2019-01-07 11:36:46 (version 32).